I participated in a Blogger Activation on behalf of Mom Central Consulting for Kidoodle.TV. I received a promotional item and a free trial as a thank you for participating. All thoughts and opinions are 100% my own. 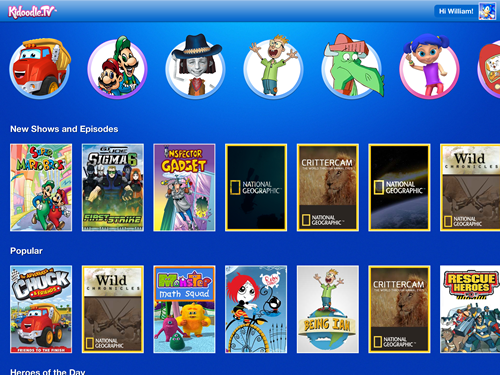 There are several video subscriptions apps/sites out there but few that are made specifically for kids. Why is that important? Well for me, when I have young children using my tablet, laptop, etc. to watch movies or TV shows online, I want to make sure they are watching age appropriate material. Sometimes it can be way too easy for them to accidentally click over to the adult videos. Filter your content with the appropriate age settings. My eight year old appreciates this since that means he doesn't have to wade trough toddler programming to get to what he wants. Manually select or deselect titles.I love this feature because it allows me to remove a specific show from my child's profile. So for example if there was a show I heavily disliked listed there, I can just deselect it and my son will never even see it as an option.Thankfully I haven't come across any forbidden for him titles yet so we're all good. 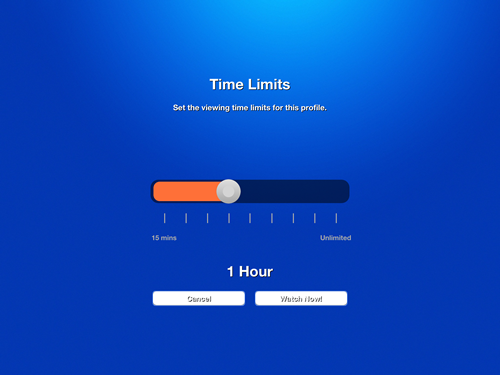 One of my favorite features is also the Time Limit function. We all know we need to keep screen time to a minimum as best we can, so having this little reminder that it is time to "unplug" is perfect. You can set the limit up knowing that if you are distracted by other children our housework, the app will help you and let the child know they are done. I have been using the iPad app more than the website and it has been great so far. It is set up almost exactly like the website so you don't need to learn a new interface in order to use it. Since my four year old doesn't really use the computer yet but is pretty darn fluent on the iPad, this was perfect for him to scroll through and pick videos to watch. As the youngest of 4 boys he tries so hard to be independent and this makes him feel like he has a little bit of that. 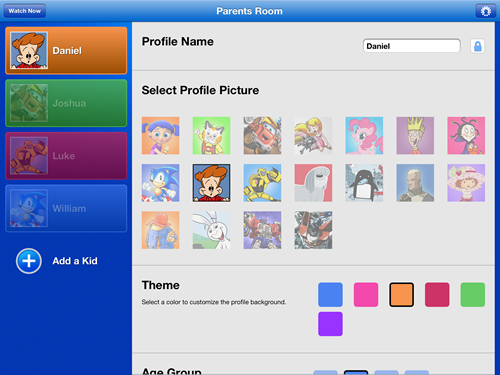 Once your child is on their profile page, they will see all the titles available to them based on the restrictions that you have set behind the scenes. The site is crisp and clear making it easy for little eyes and hands to navigate. I also really like that I see different titles here than I do on other video subscription sites. For instance the National Geographic videos shown on my 8 year old's profile above. He loves animal related documentary style videos and these are so perfect for him. He hasn't made his way through them all yet, but he will. Kidoodle.TV has been awesome for our family so far and I'm looking forward to continuing to use it over the next few months. Try Kidoodle.TV for FREE and enter by December 31, 2013to win 1 of 10 tablets or 1 of 10 Kidoodle.TV year-long subscriptions! To enter visit Kidoodle.TV to sign up for a free trial. Follow the on-screen directions and submit! The days around the holidays are some of the most traveled days of the year and when traveling with children, especially young children, it can be stressful and exhausting. I am lucky that the furthest we have to travel is an hour, but plenty of families have much further to go. Netflix can help keep the kids busy in the car or while sitting in Grandma's house impatiently waiting to open present. When you download the Netflix app to your smartphone or tablet, you can then watch your favorite movies and shows wherever you have WiFi or 3G/4G. I have it on both my iPhone and iPad which gives me the ability to have 2 kids watching 2 different things at the same time. Tell me that isn't awesome? So when they are getting antsy on Christmas Eve, I can divide them up to buy myself a few minutes till present time! We love Christmas in our house and in turn love watching Christmas movies. So between Thanksgiving and now, we've been using Netflix to watch some of our favorites like The Polar Express and enjoy some new to us ones like Dreamworks Holiday Classics, which is made up of 4 short films. My four year old absolutely loves those Madagascar Penguins so he likes to request that one. All of my boys also fell in love with Little Brother, Big Trouble and when the little guy had 104.6 fever over the weekend (thank you strep throat), we snuggled up on the couch and watched it together. There are plenty of holiday titles to choose from on Netflix ranging from preschool ages shows like Super Why to family movies like Santa Paws and finally more adult oriented flicks like National Lampoon's Christmas Vacation. 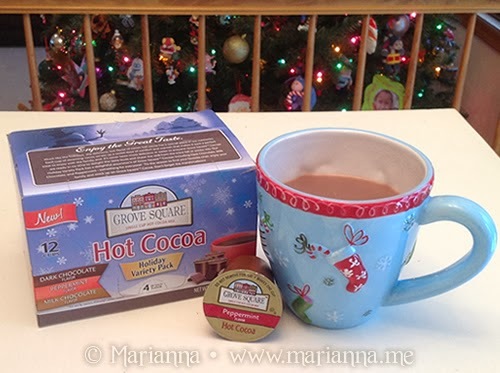 Basically, there is something for everyone to help get you in the holiday spirit! 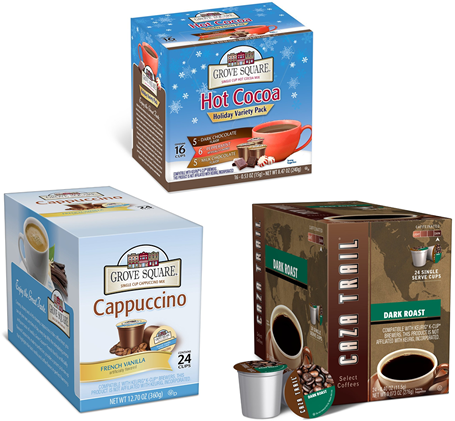 Looking for something delicious for the family to share while watching some of your favorite holiday movies? 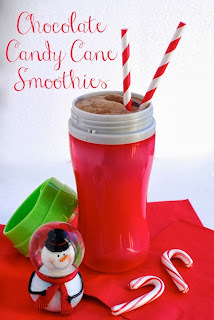 Check out this recipe for Chocolate Candy Cane Smoothies. I love this because it uses all natural ingredients and is packed with some protein. If you and your kids do have a long car ride ahead of you this holiday, bringing along something fun for them to do is a must. 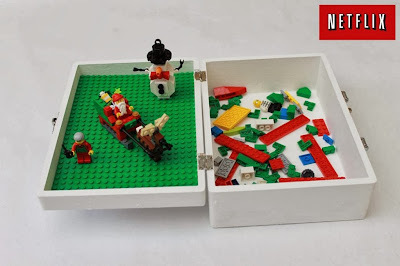 I love the idea of this Traveling Lego Box, which can keep their minds and hands busy for a while. Like I said, we aren't going to far for Christmas, but I plan on using this idea when we hit Disney in 2014 (Connecticut to Florida is a long drive with 4 kids!). This post has been brought to you by Target. All thoughts and opinions are 100% my own. I have four young boys, which makes my holiday shopping absolutely insane. Between the amount of gifts I have to buy and all of my trips to the store, I am exhausted by the time Christmas finally rolls around. Target is one of my favorite stores to shop at year round but even more so at the holidays because they always have what I am looking for. Earlier this Fall we got the Skylanders Swap Force game, but we are still in dire need of the swappable characters. Most of the other stores I looked at locally are sold out, so Target was my last hope. 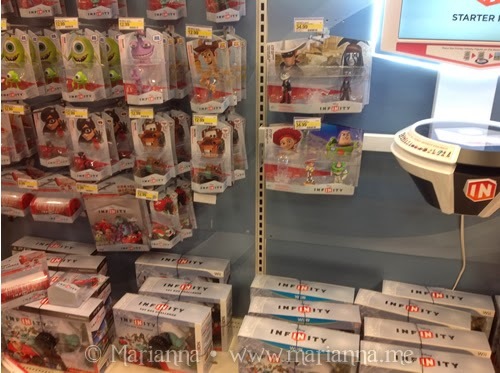 Luckily when I turned into the Skylanders/Infinity aisle, I saw it was still pretty packed. Armed with my list of characters that Grammy already purchased I was able to find 4 of the new Swap Force swappable figures that we still needed. All 4 wound up in my cart. Santa just happens to be bringing the boys the Disney Infinity for Xbox game this Christmas, so we are going to need a few of those characters too. 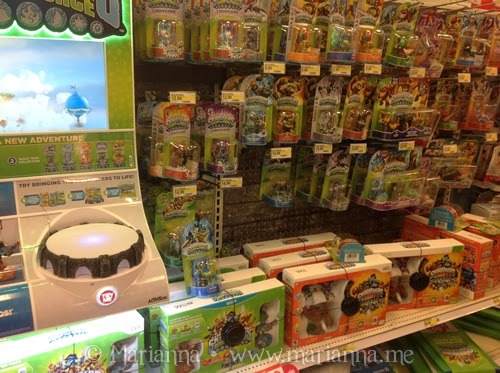 Ya know, because the 50 Skylanders we already have isn't enough. I'm not sure what Santa was thinking here. Target had a bunch of figures to choose from and thnakfully they had the only one I was looking for: Davy Jones. Now as if the holidays alone weren't enough, 8 days before Christmas is also my youngest sons birthday. Which means even more shopping. I always find this a struggle because I start to run out of ideas for him. Since he is obsessed with Batman lately (he will be 4), I headed over to the DC Comics toys to see if I could find anything for him that didn't have 50 million little pieces. 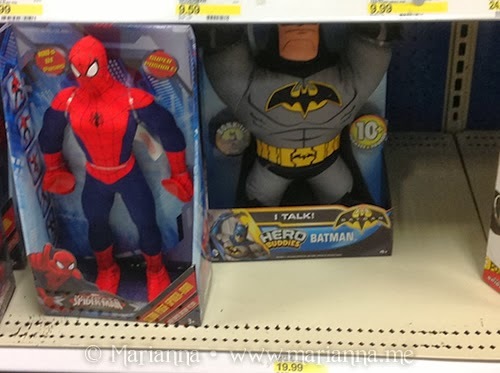 And right there on the bottom shelf was a talking Batman doll - perfect! I can totally see him lying in bed with this while wearing his Batman pajamas, he's going to love it. With that, I headed over to checkout with what was hopefully the last of my Christmas shopping. I felt rather satisfied after this shopping trip because I got everything I walked in the doors for. And luckily I had my husband with me to distract said youngest child so he didn't notice everything I was buying. In the end I purchased the 4 Swap Force figures, 1 Disney Infinity figure, talking Batman doll, 2 Minecraft dolls, DC themed Hotwheels cars, kid's toothpaste and a snack of Goldfish for my little monkey. The second best part of this trip was being able to pay with my eGiftCard using the Target app on my iPhone. While I love shopping online, especially during the holidays when the stores are crowded, there are times I just prefer to shop in person. 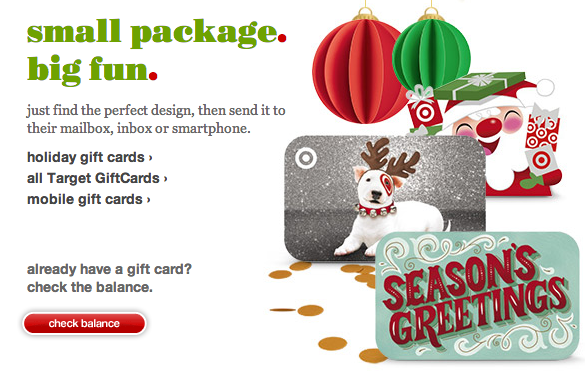 So it is pretty cool that now if I get an eGiftCard for Target, I can use it to shop in either place.And if you are struggling with those last few people on your holiday shopping list, you can't go wrong with a gift card. 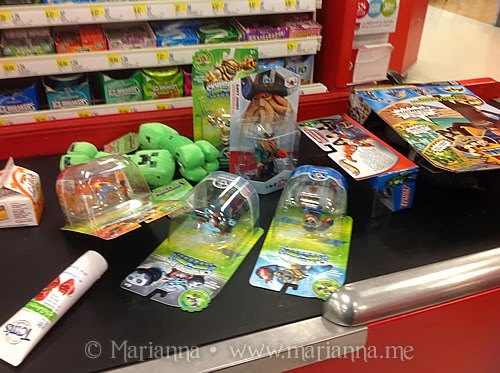 Have you done any shopping for your children at Target this holiday season? 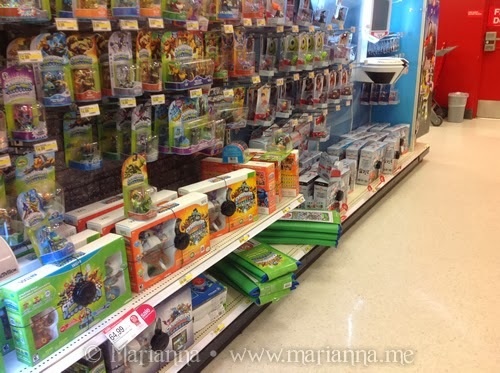 Check out the great deals on Kid's toys only @Target! 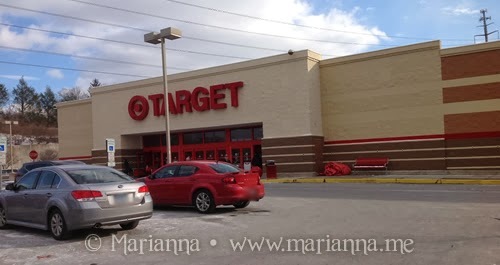 One (1) winner will receive a $25 Target eGiftCard. 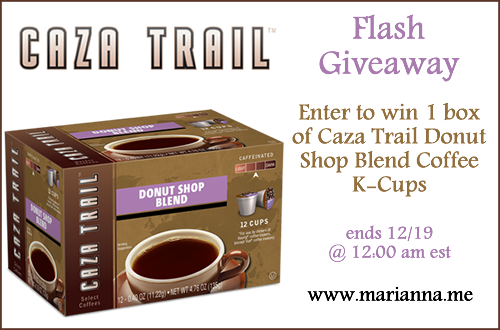 Giveaway is open to US residents only and will end on December 18, 2013 at 12:00 AM EST. Please use the Rafflecopter form below. Good luck! I participated in a campaign for Mom Central Consulting (#MC) on behalf of Konica Minolta. I received a promotional item as a thank you for participating. As a mom, I want my kids to dream big and hold onto those dreams, which is why I love hearing my eight year old tell me he is going to be an astronaut when he grows up. Konica Minolta wants to celebrate extending children’s imaginations and encouraging big dreaming with the “Giving Shape to Ideas” initiative. 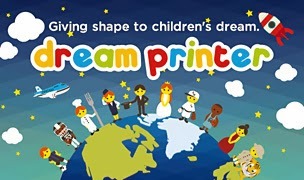 They created a “Dream Printer,” placed in a New York State park, where kids could approach the printer and share with it what they wanted to be when they grow up and the printer then gives them a caricature style picture of themselves in that profession. My son would have flipped out to see a picture of himself as an astronaut! What are your kids dreams? Please take a few minutes to watch the video below and be sure to share it with your friends. It seems like everyone has a child asking for a smartphone this holiday season. If you are like me, you want them to have a phone as a way of getting a hold of you but you also have concerns about how they use it and for what. 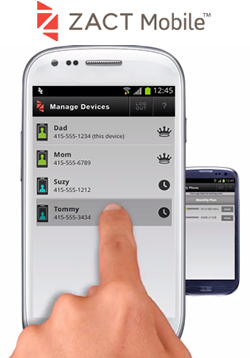 Zact Mobile is a no contract, nationwide mobile service that has parental controls where parents can easily set amount of text and data usage, set curfews (such as meal and bed times), set allowed or blocked contacts, and control which apps your child has access to. Plus the Zact plans are shareable which means if you have more than one child on the plan, they can share not only minutes but text and data as well. If your child is asking for a smartphone, check out Zact Mobile and learn how their features can provide you with peace of mind! Parental Controls with Zact from Zact Mobile on Vimeo. I participated in a campaign on behalf of Mom Central Consulting for Soundfreaq. I received a Soundfreaq Sound Spot to facilitate my review. We love music in our house. Whether it's listening to top 40 songs or Christmas music, my boys and i love to jam out and sing along. Since my classic iPod dies earlier this year, all of music is now stored on my iPhone plus I like to use several different streaming music apps on my iPad. Now let's face it, I love my Apple devices, but the sound quality on the built in speakers is just meh. So having any easy, clear way to listen to the music is a must. Last year I had the chance to review the SoundFreaq Sound Kick Bluetooth Speaker and I fell in love. Now this year, I was given the brand new Soundfreaq Sound Spot to try out and I like it even better! Sound Spot ($69) is Soundfreaq’s brand-new, award-winning wireless home speaker, which has already received a “Mashable Choice” Award. 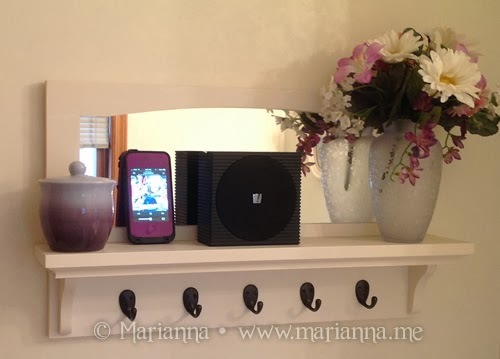 It has a small footprint so it fits anywhere in your home, making it easy to take with you from room to room so you always have music playing in your life. It now comes in 11 fun color combinations in addition to the all black and wood & white versions. Sound Spot was conceived to be portable yet look great in your home, amongst furniture, artwork and accessories. With mid-century design inspiration, Sound Spot's clean, modern look complements your home décor while filling any room in your house with your favorite music. Sound Spot streams audio via Bluetooth, the wireless standard for smart devices, so Sound Spot is compatible with all of your and your family member’s wireless devices. Sound Spot is ready to bring anywhere around the home with its small size and built-in rechargeable Lithium-ion battery, which allows for up to seven hours of AC-free listening. Sound Spot includes a USB power port so you can charge your phone, even while Sound Spot is running on battery power. Sound Spot is simple to charge just plug it directly into your computer or any powered USB port for quick and easy charging. With two Sound Spots, you have the ability to daisy chain two units together via line-out for an even louder acoustic experience. 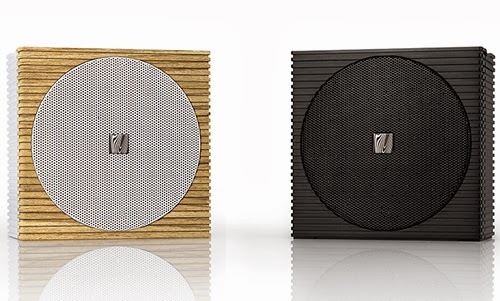 I received the two Sound Spot units show above: one in white/wood and one in all black. The first thing I loved about this speaker was the size. While the Sound Kick is great, it is also larger which it makes it a pain to move from room to room. The Sound Spot is the perfect size to room hop along with you and fit into tight spaces. So now my Sound Kick has a permanent residence in my kitchen while I can use my two Sound Spot speakers everywhere else. Since listening to music is a must in the shower for me, my black Sound Spot spends a lot of time in there or in my bedroom. The shelf in my bathroom is tiny, but that is not a problem for this speaker. Sound Spot on my bathroom shelf, playing some Lady Gaga. The white/wood Sound Spot has been spending a lot of time in the boys' bathroom these past few weeks. We just renovated this bathroom over the summer and the design fits in nicely. And at night when I am the foreman to the showers/teeth brushing/getting ready for bed assembly line, now it is accompanied by music. The boys like having music playing to sing with, especially since we've been playing Christmas songs. And well, the music just help keeps me sane. Sound Spot in kids' bathroom. 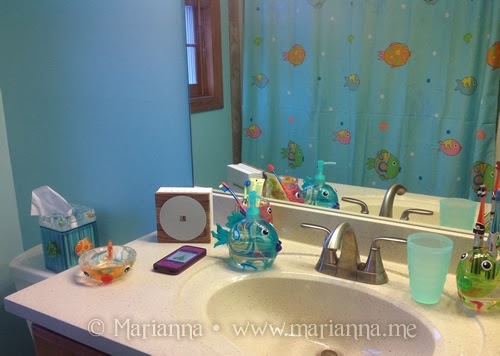 While both Sound Spots have spend a lot of time in our bathrooms, their simple design allows them to fit in with the decor of any room in my house. So when I want to bring them down into the living room or home office, either one would blend in just fine. Sound Spot in the living room. Something to point out is that while I have my iPhone right next the Sound Spot for the purposes of this photo, it does not need to be that close. I have no problem adjusting volume or skipping songs while in another room of the house. This will be particularly useful during my son's 4th birthday party next week, where I can stay in the kitchen feeding people and be able to control the speaker in the living room. The music played through the Sound Spot is crystal clear and provides a wide volume range when using both the volume on the device and on the speaker itself. I could not have asked for a better speaker! My only semi-complaint is that I wish I could connect both of my Sound Spot speakers to my iPhone at the same time so I can have the same music playing in different rooms of the house. I would just love to have Christmas music playing upstairs in my bedroom while simultaneously playing in the living room. Though honestly I'm not sure if that is something that can even be done with current Bluetooth technology, but I sure would love it! Sound Spot is available in several colors. 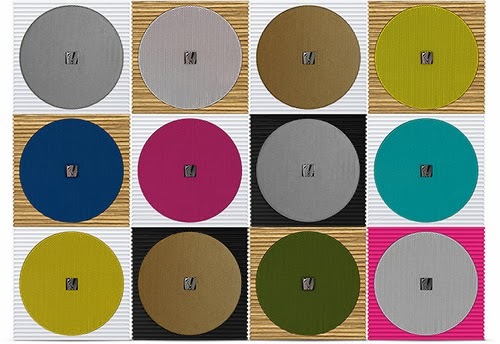 The Sound Spot is available in a variety of both neutral and fun colors that are sure to fit your style and decor. Retailing for just $69, the Sound Spot makes a great holiday gift for the music or tech lover in your life. This year is the 3rd annual Give the Gift of a Great Future Holiday Campaign, where the Boys and Girls Clubs of America inspires us to reflect on the true meaning of giving. 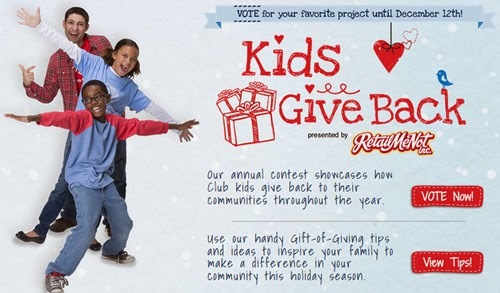 On the site you can vote in the Kids Give Back contest, showcasing BGCA kids giving back in their communities throughout the year, create and print holiday gift tags with the Gift Tag Generator and learn tips on how to inspire your kids to give back. You can also check out holiday offers and giveaways from some sponsors while you learn how you can volunteer in your own community!